Avenue Re - Creation - Ballarat District Orphan Asylum, Orphanage, Children's Home 1865-1980's Never Hidden Or Forgotten! Planted 105 Trees and brass plaques to Honour former Orphanage boys. Australia’s most decorated female army officer and former Ballarat resident Major General, Simone Wilkie, AM officially opened the re-created Arthur Kenny Avenue of Honour on Monday.The opening was held exactly 98 years after Governor General of the time, Sir Ronald Munro Ferguson planted the first tree to recognise the service of Ballarat Orphanage residents during World War One. The re-creation of the Avenue was driven by Child and Family Services Ballarat, in conjunction with the City of Ballarat, Ballarat Historical Society, Conservation Volunteers Australia, Ballarat RSL sub-branch and the Mount Xavier Golf Club. The original memorial was the vision of Arthur Kenny, who was superintendent of Ballarat Orphanage during World War One. Maj Gen Wilkie said the new Avenue would stand as a permanent reminder to the service and sacrifice of Ballarat Orphanage men who willingly gave so much. “The new Avenue of Honour is a fine edition to Ballarat’s long list of impressive war memorials, including the Avenue of Honour and Arch of Victory in Alfredton, the Australian ex-POW Memorial and the monuments along Sturt Street,” she said. “In leaving our shore and serving our country with honour they demonstrated the best of Australian military values. They displayed courage and resilience. “The service and sacrifice of the former orphanage residents is an important part of Ballarat’s World War One heritage. “About 4000 men signed up from this region to go to war and 800 gave their lives. Even before the war finished the Ballarat community realised it needed to honour the contribution of everyone who served. Among the large crowd of dignitaries that braved the cold for Monday’s ceremony at the Fortune Street site were some descendants of the Ballarat Orphanage residents that served. CAFS is now seeking private and corporate sponsorship for Algerian Oak trees and commemorative plaques to complete the re-creation. AN AVENUE will be established in honour of the more than 100 Ballarat orphans who served in World War I.
each with an attached name plaque. 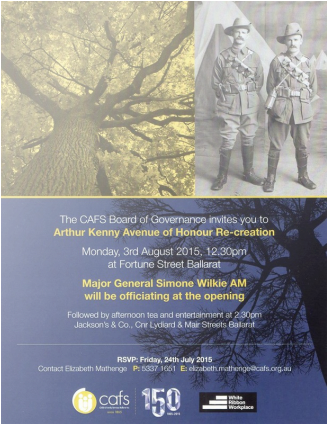 The move coincides with the CAFS Ballarat 150th anniversary next year. The avenue will be created adjacent to the original orphans' avenue, a plantation of trees and plaques which was placed at the summit of Mount Xavier in 1917. It is expected that the new avenue of honour will be completed by August next year. Ballarat Councillor Joshua Morris welcomed the proposal. "It is a great outcome for an initiative that symbolises an important part of Ballarat's history," Cr Morris said. Cr Belinda Coates also welcomed the move and said it was a positive result following extensive work between the council and CAFS . However, Cr Samantha McIntosh raised concerns about the nearby St Francis Xavier Primary School and whether the avenue would restrict plans for the school to extend its school yard and build walking paths and bike tracks in the future. The city's general manager of infrastructure Eric Braslis said the council would continue working with the school to develop its site and it was unlikely the avenue would impact any future developments. CAFS Ballarat chief executive Allan Joy on Monday said the new avenue was a key component of the organisation's 150th anniversary celebrations, with many Ballarat residents unaware of the original site. The Fortune Street location identified by the council is deemed suitable due to a lack of underground services, no overhead power lines and minimal vegetation. The project is expected to cost about $25,000, with the council to vote on a recommendation to provide $10,000. Ballarat City Council To Consider New Avenue of Honour. MORE than 100 Ballarat orphans who served in World War I could be commemorated with an avenue of honour in Ballarat East under a proposal by Children and Family Services (CAFS) Ballarat. Coinciding with the CAFS Ballarat 150th anniversary next year, the proposal would see 105 trees planted in Fortune Street, each with an attached name plaque. The new avenue of honour would be adjacent to the original orphans’ avenue, a plantation of trees and plaques which was placed at the summit of Mount Xavier in 1917. Research by CAFS has resulted in a commemorative book called The Re-Discovery of the Ballarat Orphanage’s Arthur Kenny Avenue. The book details the building of the original avenue around a circular track, which can still be seen by the keen eye. The City of Ballarat council will on Wednesday consider a recommendation that would see the new avenue of honour completed by August next year. CAFS Ballarat chief executive Allan Joy said the new avenue was a key component of the organisation’s 150th anniversary celebrations, with many Ballarat residents unaware of the original site. “There were 105 orphans who served in the war and at one stage there was a beautiful avenue commemorating them,” he said. “But people have forgotten it was ever there, so we have been negotiating with the council to reinvent it for some time. The original avenue is on Crown land, with the council indicating it couldn’t logistically be reinstated. “Fortune Street would provide for what is considered to be an appropriate level of public visibility and accessibility to allow the avenue of honour to become a recognised feature of the Ballarat landscape,” the council agenda states. Mr Joy said CAFS, an institution in Ballarat, should be cemented in Ballarat’s history. “2015 will be a big year for us and to see this avenue take shape would be a great part of our celebrations,” he said.